Hello! 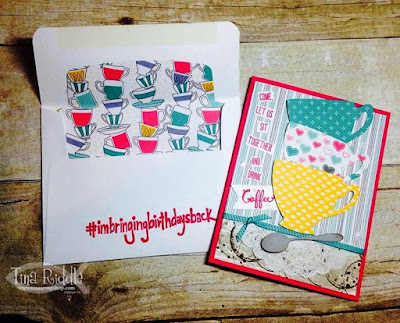 It's ICS blog hop time! Our theme is ‪#‎imbringingbirthdays‬back inspired by Shannon West, one of the trainers at Stampin' Up! She posted on her facebook page in January that social media had ruined the good old fashioned birthday card and she was bringing them back this year! Shannon also carved out a stamp to use on her cards. Well let me tell you the idea really caught on. I'm sure the post office is loving her! Stampin' Up! took that carved stamp and made one we could all have too! I'm stamping the back of my envelopes with that stamp for all of my birthday cards! :) Well, I'm so glad you stopped by today! I am totally on board with bringing birthdays back and so excited to be working on my stash of birthday cards so they are ready to send out! If you have already been hopping you should have landed here from my friend Megan's blog! If you missed it, make sure you hop through and check it out!! Today's card is for my sweet friend, Suzi! She and I LOVE coffee and any chance to go for coffee, is a good day so of course I had to make a coffee themed card for her, right?? For my card, I started off with an A2 Melon Mambo card base. Next I stamped the bottom of a 5 1/4" x 4" piece of Whisper White cardstock with the woodgrain looking stamp from the "Timeless Textures" stamp set in Sahara Sand ink. This stamp set is quickly becoming one of my favorites! 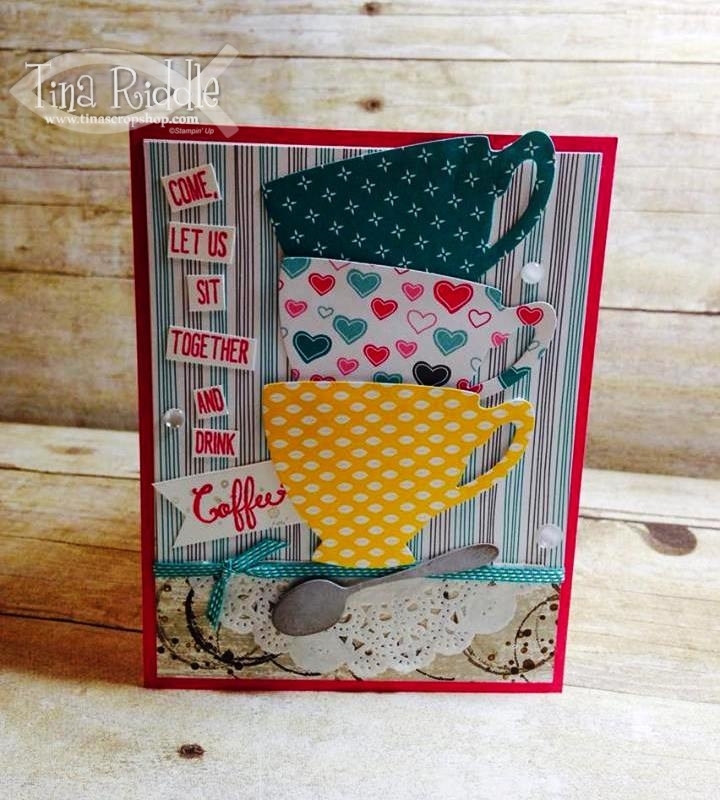 I used Early Espresso ink to stamp the coffee rings and the splatters (also from the Timeless Textures stamp set). Some of the splatters and rings were stamped off on scrap paper prior to stamping on the bottom of my cardstock. I added a 4" x 4 1/4" piece of the "Have a cuppa DSP stack" to the top portion of my card. I cut a piece of the tea lace doily and attached to the "table" with snail. Then I ran a piece of 1/8" Bermuda Bay stitched ribbon along the edge seperating the table from the wall. I used more of the "Have a cuppa DSP stack" to cut out my cups with the Cups and Kettle Framelits Dies. I adhered the top one first with snail, the middle with snail and glue dots, and the bottom one with dimensionals. The spoon was cut out in Smoky Slate cardstock and sponged on the edges with Sahara Sand Ink and it was attached with glue dots. The sentiment from the "Balloon Celebration" stamp set was stamped in Melon Mambo onto Whisper White cardstock and then cut apart and glued onto the card front randomly. on the left side of the cups. 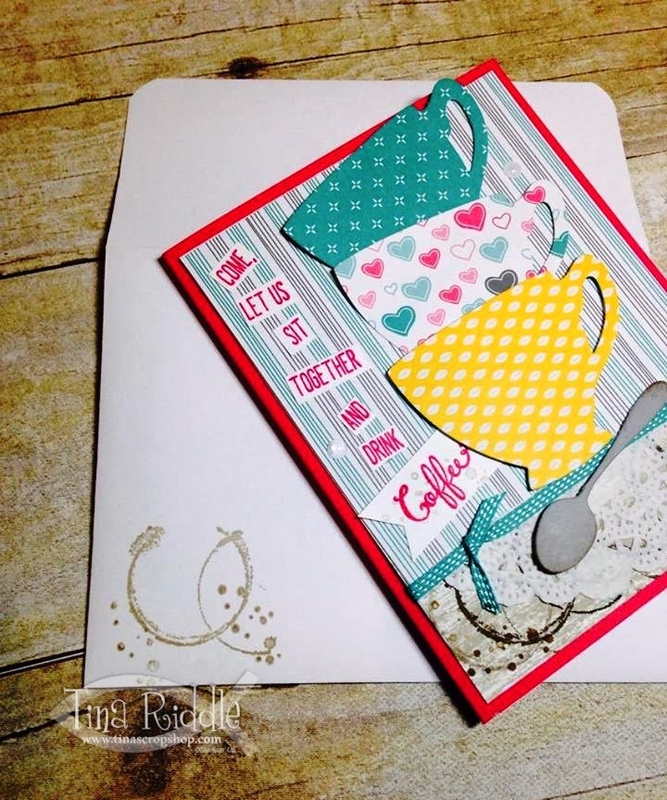 The "coffee" sentiment had a banner end cut with the Triple Banner Punch and a few splatters were stamped onto the Whisper White with Sahara Sand Ink for a subtle look. Last but not least I added three white Enamel Dots randomly on the front. I stamped the inside sentiment from the "Balloon Celebration" stamp set also in Melon Mambo onto Whisper White Cardstock. You can't have coffee without cake, right?? The coffee ring and splatters were stamped on the lower left side with Sahara Sand Ink. We can't forget the envelope, right? I used the Envelope Liner Framelits dies to cut out a liner with more of the Have a Cuppa DSP. And of course.. 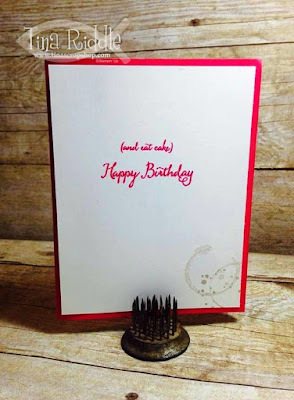 I stamped the back with my #imbringingbirthdaysback stamp in Melon Mambo Ink. 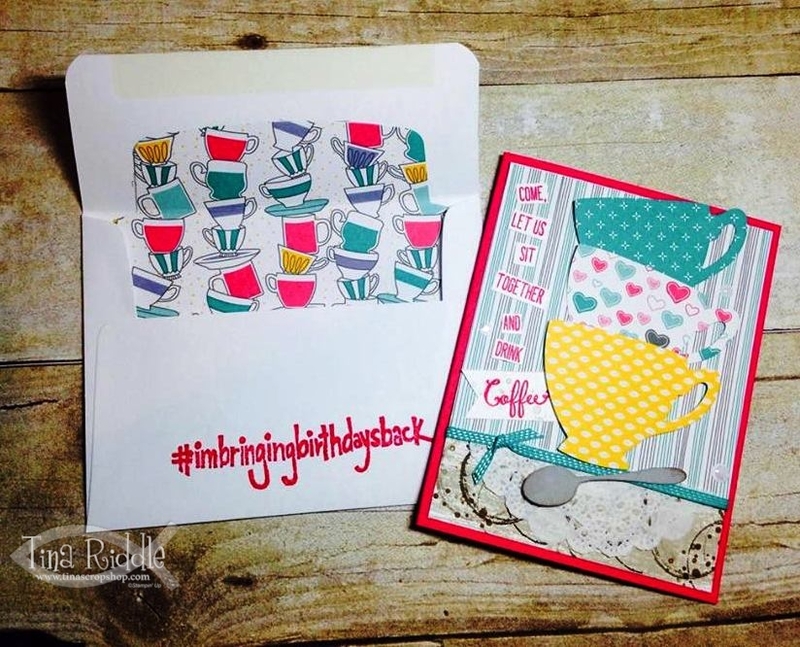 Next up is the fabulous Joni Metras so make sure you click the Next button and check out her #imbringingbirthdaysback inspiration! ADORBS! Really love all the color! Thanks for sharing and for hopping with us this month! Really cute card and envelope too! Your friend ia going to love her card! Thanks Darla! :) I think she will too! Tina I love the card, great use of everything. ok I adore this card!! I love the use of the DSP, the layout, the colors, everything!!! Very nice!!! Love the layers of textures your card has! I absolutely love the card! Cute! Love how you cute out all the little words & coordinated the card and envelope.